Roberto was by Hail To Reason – Bramalea by Nashua. Bred and raced by John W. Galbraith at his Darby Dan Farm in Kentucky, his pedigree shows a 4 x 4 inbreed to Nearco. Galbraith was also the owner of the Pittsburgh Pirates baseball team and named the colt in honour of his star outfielder Roberto Clemente. Bramalea, the dam of Roberto, was a top class race horse with wins in the Coaching Club American Oaks and the Gazelle Handicap on her resume. Her Hall of Fame sire Nashua needs little introduction to racing fans, as he is one of the greatest runners in American history. Roberto’s sire Hail To Reason is also counted among the elite American thoroughbreds, especially pertaining to his Hall of Fame stud career. To say that Roberto was regally bred, would be an understatement. Sent to trainer Vincent O’Brien in Ireland, Roberto became the champion two year old in that country winning the Anglesey Stakes and the National Stakes at the Curragh. His first start as a three year old was a winning one in the Vauxhall Trial Stakes. His next race was the 2000 Guineas at Newmarket, finishing second to High Top. Lester Piggott took the reins for his start in the Epsom Derby. In the race, in which Roberto was the 3/1 favourite, Piggott urged Roberto to the lead just after Tattenham Corner at the beginning of the very long Epsom home stretch and held off the challenge of Rheingold to win the Derby by a neck. This gave his sire Hail to Reason a winner in two prestigious Derbies, one on either side of the Atlantic. Later in the year Roberto entered the inaugural Benson and Hedges Gold Cup run at York. Piggott had decided to ride Rheingold instead, so Galbraith enlisted top American based jockey Braulio Baeza to come to England and ride Roberto in the lucrative event. Baeza had never ridden in a race in Europe before. Also in the field was the undefeated four year old Brigadier Gerard, who the British racing press considered to be unbeatable. Baeza used the American tactic of taking command of the pace from the off. He would gun Roberto right from the opening of the starting stalls, relax and conserve energy during the mid-section of the one and a quarter mile race, and ask Roberto for everything he had left to complete the distance. The strategy worked as Roberto was never headed, setting a new course record in the process. Brigadier Gerard had suffered his first and only defeat. Roberto was crowned the champion three year old in England and Ireland. In a sadly ironic and unfortunate twist of fate, the man for whom Roberto was named in honour of, Roberto Clemente would perish in a plane crash on a mission of mercy the same year in which Roberto the horse was achieving his most prestigious victories. Back to the races as a four year old, Roberto won only once in the Coronation Cup at Epsom, Lester Piggott up. He was retired from racing with a record of nine wins, two seconds and two thirds from eighteen starts. Roberto went back to Darby Dan Farm to begin his career at stud. He would become a very influential sire both at home and abroad, siring eighty-seven stakes winners in worldwide events. Roberto remained at Darby Dan until his death at the age of nineteen, in 1988. One of the major winners sired by Roberto was Sunshine Forever. Sunshine Forever won three grade one races, the Washington DC International, The Man O’ War Stakes and the Turf Classic, on his way to championship honours as the top grass runner of 1988. He also added the Hill Prince Stakes and the Lexington Stakes to his resume. He was retired to stud after his four year old season, which was not a success, to Darby Dan. He was subsequently sent to Japan. In 2004 he was repatriated to Old Friends retirement home to live out his life. Silver Hawk was the winner of the Craven Stakes and the Solario Stakes. He was second in the Irish Derby and third in the Epsom Derby. He became a sire of note getting the ill-fated Benny the Dip (1997 Epsom Derby) and grade one winner Hawkster (Secretariat Stakes and Oak Tree Invitational etc). Roberto’s son Brian’s Time was victorious in the Jim Dandy Stakes, the Pegasus Handicap and the Florida Derby. Sold to Japanese interests for syndication and stud duty, Brian’s Time became one of the top sires in Japan. Among his top racing get are Narita Brian (Japanese Triple Crown winner 1994), and Higashi Brian (dam of Sunrise Pegasus by Sunday Silence). The globe trotting horse At Talaq won the Grand Prix du Paris in France, was second in the Grosser Preis von Berlin in Germany, third in the Derby Italiano, and then won the Melbourne Cup in Australia. Upon arrival in Australia he subsequently stayed there to win the McKinnon Stakes and C. F. Orr Stakes. At Talaq was amid a good career as a sire in Australia, getting twenty-five stakes winners including Skating and Al Mansour, before his early death in 1995 at the age of fourteen. Touching Wood would prove to the breeding world that Roberto was very capable of siring true stayers. He won the St. Leger Stakes in both England and Ireland, and added the Welsh Stakes to his name. His second place finish to Golden Fleece in the Epsom Derby was also a fine performance. He entered stud at Dalham Hall Stud in 1983 and then exported to New Zealand in 1988. The good stayers Ashal (Ascot Gold Cup), Great Marquess (Doncaster Cup) and Lucky Moon (Goodwood Cup) were perhaps his best. Real Shadai achieved victory in the Grand Prix de Deauville, his biggest moment on the track. However upon retirement to Shadai Stallion Station in Hokkaido, Japan, he became very influential as a sire there. The leading sire in Japan in 1993, he would sire Shadai Kakura (Champion Three Year old in Japan 1989) and Rice Shower, winner of the Kikuka Sho (Japanese St. Leger) and the spring running of the Teeno Sho (Emperor of Japan Stakes) twice. Lear Fan was foaled in 1981, which just happens to be the same year as El Gran Senor, Rainbow Quest, Darshaan, Sadler’s Wells, Palace Music and Chief Singer. This is one of the best generations of Thoroughbreds in history. He was three for three as a two year old but did not meet any of the top colts. As a three year old he would beat Rainbow Quest in the Craven Stakes and then was third in the 2000 Guineas to El Gran Senor and Chief Singer. After a three month rest, Lear Fan was in the Prix Jacques le Marois at Deauville, which he won by four lengths over Palace Music. His final race was a dismal seventh to Royal Heroine at Hollywood Park in the 1984 Breeder’s Cup Mile. Sent to stud at Gainesway Farm, Lear Fan became another successful son of Roberto as a sire getting sixty-five stakes winners including, Ryafan (Champion Three Year old in Europe and Champion older Turf Mare in North America), Labeeb (Woodbine Mile and Hollywood Derby), Go Ba Ba (Hong Kong Mile, Queen’s Silver Jubilee Cup etc) and Sikeston (Gran Criterium, Queen Anne Stakes etc). Lear Fan was also the broodmare sire of Johar (Breeder’s Cup Turf) and Kitten’s Joy (Champion Grass horse in North America), the leading sire in North America for 2013. Robellino was an American bred group stakes winner in England. He began his stud career in Pennsylvania, transferred for two seasons at Windfields Farm in Maryland. and later moved to Littleton Stud in England. Robellino sired three classic winners in his successful career. Mister Baileys (2000 Guineas), Classic Park (Irish 1000 Guineas), Robertico (German Derby), Royal Rebel (Ascot Gold Cup twice), and two-time Irish champion Rebelline were his best. Roberto consistently proved to be a good sire of sires as his sons Kris S, Dynaformer and Red Ransom bore this out. Kris S had an abbreviated career on the track, limited to five races but did manage to win the ungraded Bradbury Stakes to earn black type honours. He began his stud life in 1982 at Meadowbrook Farm in Florida and became a success. Consequently, in 1993 he was transferred to Prestonwood Farm in Kentucky (Prestonwood was soon to become Winstar Farm). 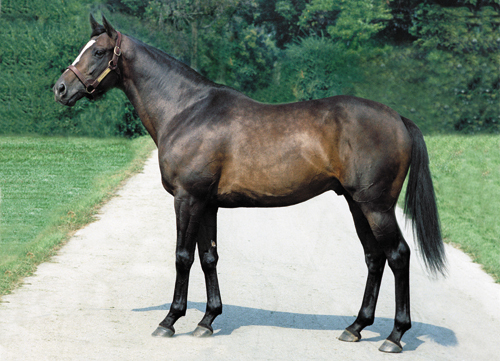 This dark brown son of Roberto – Sharp Queen by Princequillo sired five Breeder’s Cup winners among his sixty-three stakes winners. Kris S sired Prized (Breeder’s Cup Turf, Woodbine Million etc), Soaring Softly (Breeder’s Cup Filly and Mare Turf and N. A. Champion Turf Mare), Brocco (Breeder’s Cup Juvenile, Santa Anita Derby etc), Hollywood Wildcat (Breeder’s Cup Distaff and Champion Three Year old Filly), and Action This Day (Breeder’s Cup Juvenile and Champion Two Year Old). Other notable winners sired by Kris S are, Kris Kin (2003 Epsom Derby), Symboli Kris S (two time Japanese Horse of the Year), Kissin Kris, Kudos, Cheval Volant, Adonis and Rock Hard Ten. He would also become the broodmare sire of War Chant and the remarkable Zenyatta. Red Ransom was a very fast colt. He won his maiden race, a five furlong sprint at Saratoga in a blistering 56:80 seconds, setting a new track record as a two year old. Red Ransom won his next start at Belmont and then was not seen on the track until March of his three year old season. He finished second in his three year old début but unfortunately fractured a sesamoid in a subsequent workout, ending his racing career. Despite not attaining black type status on the track, Red Ransom was a well supported young sire when he went to stud at the Vinery in Midway Kentucky. He was one of the earliest shuttle sires, plying his trade in England and Australia as well as Kentucky. Red Ransom sired Epsom Oaks winner Casual Look, triple group one winner Electrocutionist (Gran Premio de Milano, Dubai Cup and Juddmonte International), $1 million plus earners Ekraar (England), Charge Forward (Australia), as well as Roc de Cambes and Juno Pentagon who both raced in Japan. Additional millionaires include Perfect Sting, winner of the Breeder’s Cup Filly & Mare Turf, European Champion sprinter Red Clubs, and six times group one winner Typhoon Tracy, the 2009-10 Australian Horse of the Year. Perhaps the most successful son of Roberto as a sire was Dynaformer. Winner of the Jersey Derby, Discovery Stakes and the Lucky Draw Stakes as a three year old, Dynaformer was not exactly Roberto’s most decorated runner. Dynaformer was a notoriously bad tempered sort who has been known to seriously injure many handlers during his life. His temperament likely compromised many races. Dynaformer died, age twenty-seven, from the complications of an aortic valve rupture on April 29, 2012 at Three Chimneys Farm in Kentucky. At the time of his death he had sired one-hundred and thirty stakes winners, sixty-one of which were graded/group stakes winners. Dynaformer sired many horses who would be top stayers in their respective generations, again emphasising the ability of his sire line to get such animals. Perhaps his best was the ill-fated Barbaro, who won the 2006 Kentucky Derby. Winner of the Laurel Futurity as a two year old, Barbaro warmed up to his Derby victory by winning the Tropical Park Derby, the Holy Bull Stakes and the Florida Derby. Following his false start in the Preakness, he would shatter his right hind leg as the field passed the grandstand for the first part of the race. Herculean efforts to save Barbaro, which included seven operations, cutting edge medical treatments and special post surgical care by dedicated veterinarians and horseman, could not prevent the inevitable however. He would develop laminitis which further complicated his recovery and the decision was made on January 29, 2007 to euthanize Barbaro and put an end to his suffering. Dynaformer also sired Lucarno (English St. Leger Stakes and Champion Three Year old in England), Mystery Giver (three time winner of the Fair Grounds Handicap etc), Perfect Drift (Hawthorn Gold Cup, Stephen Foster Handicap, Washington Park Handicap twice etc), Americain (Melbourne Cup etc), Rainbow View (Champion European Two Year Old Filly), and Point of Entry (four grade one wins including the Man O’ War, Gulfstream Park Handicap etc) who is entering stud at Adena Springs Kentucky Division at time of writing. Roberto has sired a legacy that should be on going for quite some time. 17% of his progeny were stakes winners and are scattered all around the world, providing continuing excellence through their sons and daughters. Roberto died on August 2, 1988 and is buried at Darby Dan Farm. The Epsom Derby winner had meant so much to Darby Dan. I saw the bent bars at the bottom of Dynaformer’s stall from his kicks but the groom told me that he was his favorite of the stallions. Others also loved him.